Objective To assess effectiveness of school-based smoking prevention curricula keeping children never-smokers. Design Systematic review, meta-analysis. Data: MEDLINE (1966+), EMBASE (1974+), Cinahl, PsycINFO (1967+), ERIC (1982+), Cochrane CENTRAL, Health Star, Dissertation Abstracts, conference proceedings. Data synthesis: pooled analyses, fixed-effects models, adjusted ORs. Risk of bias assessed with Cochrane Risk of Bias tool. Setting 50 randomised controlled trials (RCTs) of school-based smoking curricula. Participants Never-smokers age 5–18 (n=143 495); follow-up ≥6 months; all countries; no date/language limitations. Interventions Information, social influences, social competence, combined social influences/competence and multimodal curricula. Outcome measure Remaining a never-smoker at follow-up. 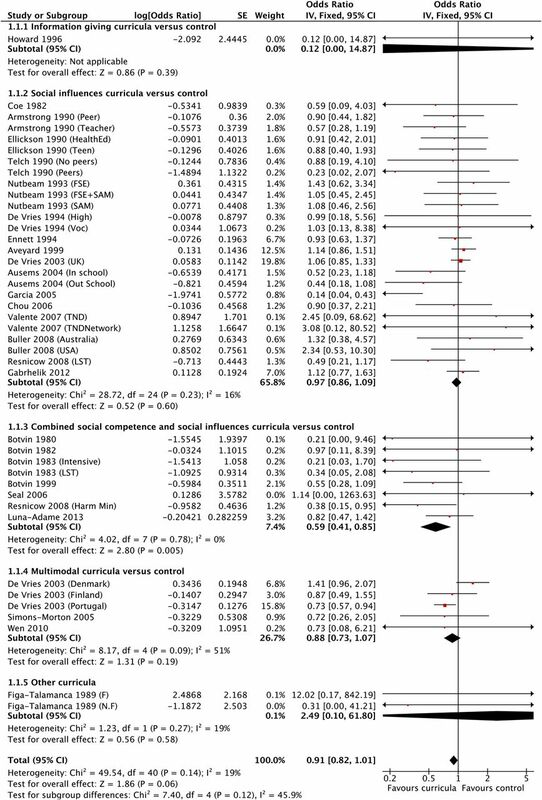 Results Pooling all curricula, trials with follow-up ≤1 year showed no statistically significant differences compared with controls (OR 0.91 (0.82 to 1.01)), though trials of combined social competence/social influences curricula had a significant effect on smoking prevention (7 trials, OR 0.59 (95% CI 0.41 to 0.85)). Pooling all trials with longest follow-up showed an overall significant effect in favour of the interventions (OR 0.88 (0.82 to 0.95)), as did the social competence (OR 0.65 (0.43 to 0.96)) and combined social competence/social influences curricula (OR 0.60 (0.43 to 0.83)). No effect for information, social influences or multimodal curricula. Principal findings were not sensitive to inclusion of booster sessions in curricula or to whether they were peer-led or adult-led. Differentiation into tobacco-only or multifocal curricula had a similar effect on the primary findings. Few trials assessed outcomes by gender: there were significant effects for females at both follow-up periods, but not for males. Conclusions RCTs of baseline never-smokers at longest follow-up found an overall significant effect with average 12% reduction in starting smoking compared with controls, but no effect for all trials pooled at ≤1 year. However, combined social competence/social influences curricula showed a significant effect at both follow-up periods. Systematic review registration Cochrane Tobacco Review Group CD001293. This review and meta-analysis provides evidence from 50 randomised controlled trials with 143 495 participants. Comprehensive searches with no limits on data and language mean that it is unlikely trials were missed. Using smoking outcomes from cohorts of baseline never-smokers provides the clearest indication of whether smoking prevention curricula are effective. Statistical heterogeneity between the trials was low and results were consistent after various sensitivity analyses. Not all trials reported outcomes based on cohorts of baseline never-smokers and though authors were contacted it is possible that the data may be incomplete. The complexity and reporting of some curricula can make them difficult to classify and therefore the classification of curricula may not be completely accurate. In the USA, it has been estimated that of those children who were 17 or younger in 1995, five million would die prematurely of tobacco-related causes, and that 20% of deaths could be avoided if smokers had either never started or had quit.2 In 2007, in the USA, 20% of high school students reported smoking in the past 30 days,3 and in the UK, the prevalence figures report a smoking rate of 6% within the 11–15 age group.4 Starting smoking usually leads to the behaviour lasting decades, with smokers having great difficulty in quitting. Villanti et al5 identified five types of smoking behaviour as adolescents become young adults: non-smokers, early stable smokers, late starters, quitters and ‘light or intermittent smokers’. Over the past three decades, the school environment has been a particular focus of efforts to influence youth smoking behaviour. The main perceived advantages are that almost all children can be reached through schools and a focus on tobacco education fits naturally within their daily activities. Researchers have used five types of curriculum in schools, each based on a different theoretical orientation: information-only curricula, social competence curricula, social influence curricula, combined social competence/social influences curricula and multimodal curricula6 (box 1). Interventions that provide information to correct inaccurate perceptions regarding the prevalence of tobacco use and oppose inaccurate beliefs that smoking is social acceptable. Interventions that help adolescents refuse offers to smoke by improving their general social competence and personal and social skills. Interventions teach problem solving, decision-making, cognitive skills to resist personal or media influences, increase self-control and self-esteem, coping strategies for stress and assertiveness skills. Interventions that endeavour to overcome social influences to use tobacco by teaching adolescents to be aware of social influences that encourage substance use, teach skills to resist offers of tobacco, and deal with peer pressure and high-risk situations that might persuade an adolescent directly or indirectly to smoke. Programmes in schools and the community, involving parents and community members, initiatives to change school or state policies about tobacco sales and taxes, and to prevent sales to minors. School antismoking policies, motivations to smoke, classroom good behaviour. Social competence interventions help adolescents refuse offers to smoke by improving their general social competence and personal and social skills. Adolescents are taught a combination of skills to improve problem solving, decision-making, self-control, self-esteem, assertiveness and strategies to cope with stress, and to resist general personal or media influences. Social influence interventions focus specifically on teaching adolescents skills for awareness of social influences that encourage substance use, and to resist tobacco offers, peer pressure and high risk situations that might persuade an adolescent directly or indirectly to smoke. Some studies have tested teaching skills to resist multiple problem behaviours such as drinking and drug use as well as tobacco use. Multimodal interventions can be broad ranging, including tobacco prevention interventions in schools, the community, and with parents and community members, and school or state policies to change tobacco sales, increase taxes and prevent sales to minors. The first edition of this Cochrane review was published in 2002, included 96 studies and was narrative without any meta-analyses. The second edition incorporated meta-analyses for randomised controlled trials (RCTs) with relevant information for smoking prevention, but the largest comparison only contained 13 studies. Authors often include data for never-smokers, triers, quitters, occasional, regular and heavy smokers in their baseline and follow-up data. Some use the term current ‘non-smokers’ and include never-smokers, triers, experimenters and quitters. It is thus not possible to determine the effect of smoking prevention curricula interventions on each of these groups, and if some groups increased and others decreased their smoking, the effect of the curricula could be completely obscured. We were thus able to prespecify that the ideal outcome to give the best estimate of the prevention effect would be baseline never-smoking cohorts, and were then able to extract more evidence from existing and new studies without changing the curricula classification in the review protocol. Hence, in 2013, the second edition was updated and radically refined: we checked the theoretical orientation of each trial and all included trials were recategorised, and data completely re-extracted and reanalysed based on baseline never-smoking cohorts. The primary objective of this review is to assess the effectiveness of school-based curricula versus no curricula in preventing never-smoking children and adolescents from starting smoking. Effectiveness is the appropriate term as researchers tested interventions in real schools, but did not always control for adherence or attendance. A second objective is to assess which curricula types are the most effective. We searched the Cochrane Central Register of Controlled Trials (CENTRAL), the Cochrane Tobacco Addiction Group's Specialized Register, MEDLINE, EMBASE, PsyclNFO, ERIC, CINAHL, Health Star and Dissertation Abstracts for terms relating to school-based smoking cessation programmes from inception to January 2014, with no date or language restrictions (see online supplementary material A). We checked article bibliographies and ran individual MEDLINE searches for 133 authors who had undertaken research in this area. We searched for all trials evaluating school-based curricula to prevent smoking. There was no restriction on the theoretical orientation of the curricula providing they aimed to prevent tobacco use. Students aged 5–18 years during the intervention phase of the trial were included as individuals in RCTs and also as classes, schools or school districts in cluster RCTs (C-RCTs). Trials were excluded if there was no control group. Control groups included no curricula, usual practice or an active non-relevant control, for example, homework study group. We required a minimum follow-up of 6 months after completion of the curricula. We did not require biochemical validation of self-reported tobacco use, but recorded its use. We excluded trials that did not assess baseline smoking status or reported only smoking attitudes and knowledge. Two reviewers (RET and JM) independently assessed all titles, abstracts and full text articles for trials that met the inclusion criteria. Any disagreements were resolved by consensus or referral to a third person (RP). Data were independently extracted into RevMan7 by two reviewers (RET and JM) for each included study using a form piloted first in a small subset of trials. Any disagreements were resolved by consensus or referral to the third author (RP). We extracted data for all included trials on design and focus, country and site of school(s), participants (age, gender and ethnicity), curriculum duration and follow-up, curriculum deliverer, a brief overview of the curriculum, and details of the control group. Two authors (RET and JM) classified curricula according to their dominant theoretical orientation: information only, social competence, social skills, combined social competence/social skills or multimodal. An independent reviewer commented on this classification and as a result a small number of trials using strategies that did not fit into these broad types were grouped separately (box 1). Accuracy of category classification between the authors and the independent reviewer was tested using a κ statistic. We extracted data for never-smokers at baseline and follow-up for curricula and control groups. If authors included in the category of ‘non-smoker’ both never-smokers and those not currently smoking, we classified non-smokers with previous smoking experience as smokers for this review. We used the Cochrane risk of bias tool8 to assess whether trials were at low, high or unclear risk of selection bias (random sequence generation and allocation concealment), detection bias, attrition bias and reporting bias. If data were missing, or in a format not analysable, we contacted the authors to request the data, new data runs or clarification. We did not impute missing data. We extracted data as absolute numbers or ORs, where possible, based on loss of never-smokers from baseline to follow-up, that is, those children who started smoking. In some instances, if data were available, but only the total number of schools or classes was known and not the numbers allocated to each arm, then the number of schools or classes was estimated based on the proportion of individuals within the group. Where the authors used a denominator that did not include all the participants originally randomised (eg, a sample that the author described as the ‘analysis sample,’ which excluded drop-outs and thus had smaller numbers at follow-up) we recomputed the data based on the same percentage loss to never-smokers using the numbers originally randomised. We calculated adjusted ORs based on the number of never-smokers at specific time points. Adjustment was made for clustering by school/group based on estimated intraclass correlation coefficients (0.097) and cluster sizes to determine design effects for each of the curricula groups. We then used this design effect to determine the effective sample size for each curricula group. Our analysis examined the curricula versus the control groups at two defined times of follow-up: 1 year or less and longest follow-up. In the latter, we used one set of data at the longest follow-up point for each study, meaning that some data sets appeared in both analyses. In order to determine the impact that trials only reporting short-term follow-up (1 year or less) had on our long-term effect estimates, we carried out a sensitivity analysis excluding these studies from this estimate. A priori we identified attrition and selection as the two most relevant sources of bias. We conducted sensitivity analyses to compare the overall result of trials with low risk of attrition and selection bias to all trials to see whether the quality of the trials had any impact on the overall results. Risk of publication bias was assessed by a visual inspection of a funnel plot. We further conducted subanalyses based on gender, peer-led (or substantially peer-led) versus adult-led trials, trials with a tobacco-only focus (tobacco-only) versus multifocal curricula (curricula that focused on tobacco together with other substances such as alcohol and drugs), and curricula that had subsequent booster sessions versus those with none. Booster sessions were additional ‘refresher’ sessions separate from the initial curricula. Though not prespecified, we subsequently explored whether it was relevant to complete a subanalysis by age (age 11 and under vs over 11). We identified 256 potential RCTs or C-RCTs. Of these, 135 C-RCTs and 1 RCT provided a total of 202 different curricula arms with 431 315 participants providing data (figure 1). Trials were categorised by curricula type; the robustness of this classification was confirmed as very good when the agreement between authors and an independent reviewer was tested (κ 0.98). Flow diagram to show selection process (RCTs, randomised controlled trials). Fifty-seven of the 136 trials followed never-smoking cohorts and of these 50 C-RCTs (74 different intervention arms, n=143 495) provided analysable data for this review (figure 1). Table 1 provides a summary of the baseline characteristics of included studies. The control groups in the 50 trials were varied. In 22 (44%), the group receiving the curriculum was compared head-to-head with a control group that received ‘usual practice,’ in 12 trials the control group received no alternative curricula, nine did not state whether the control group received an alternative curricula, 1 provided no alternative curriculum in the control group in six schools and ‘usual practice’ in the control group in four schools, 2 provided only information, 1 provided a curriculum to help students complete schoolwork, 1 offered a talk by a physician on either tobacco or alcohol, 1 posted four booklets to the control group, 1 asked students to produce a newspaper and 1 helped students with reading skills. Of the 50 trials, 47 were in individual countries and 3 in multiple countries (total 60 country arms): 26 trials were from the USA, 4 each from the UK, Netherlands and Germany, 3 from each from Spain and Italy, 2 each from Australia, Canada and China and the remainder 1 each from South Africa, Thailand and across Europe (Denmark, Finland, Portugal, Austria, Belgium, Greece, Sweden and the Czech Republic). (See online supplementary material B for raw data). Forest plot showing results for all curricula versus control (1 year or less follow-up). There was no overall effect for all curricula with follow-up of 1 year or less (OR 0.91, 95% CI 0.82 to 1.01; I²=19%). The I² statistic for subgroup differences across all curricula was 45.9%, but within each curriculum type heterogeneity was minimal, except for multimodal (I2=51%). The combined social competence/social influences curricula (seven C-RCTs/eight arms) showed a statistically significant effect in preventing the onset of smoking at 1 year or less (OR 0.59, CI 0.41 to 0.85; I²=0%). However, for the social influences curricula (16 RCTs/25 arms), the multimodal curricula (3 RCTs/5 arms) and 1 small trial,36 which tested an information-only curriculum, the results were non-significant. There was no RCT testing a social competence curriculum versus control with a follow-up duration of 1 year or less. All curricula types versus control had the longest follow-up (50 trials, 74 curriculum arms, figure 3 and table 2). Forest plot showing results for all curricula versus control (longest follow-up). Fifteen trials (25 arms) provided data for analysis at follow-up of 1 year or less and for longest follow-up (34% of trials). Of the remaining trials, 86% had follow-up of between 1 and 5 years, 10% of between 5 and 10 years and 4% of over 10 years. There was a significant effect favouring all curricula compared with control for the longest follow-up periods (OR 0.88, 95% CI 0.82 to 0.95; I²=12%), with a mean risk reduction of 12%. Heterogeneity was low (0–12%), except for the multimodal curricula trials (I²=64%). Our estimate of long-term effect was robust to the exclusion of trials that reported only short-term (1 year or less) follow-up (see online supplementary material C). There were 10 trials (15 arms) that provided separate data both for analysis at 1 year or less and for the analysis at longest follow-up. Restricting the analysis to these trials alone showed the same overall effects as the primary findings, no overall effect at 1 year or less follow-up and a statistically significant effect at longest follow-up. (See online supplementary material D for sensitivity analyses). Sensitivity analyses restricted to trials at low risk of attrition bias with follow-up of 1 year or less (n=9) found no differences compared with all trials in terms of point estimates, though trials testing combined social competence/social influences curricula no longer demonstrated a significant effect when studies at unclear or high risk of bias were removed (OR 0.55, CI 0.28 to 1.09). At longest follow-up, analyses restricted to low risk of attrition bias (n=20) were similar to pooled results from all trials, except the CI was wider and hence included the line of no effect for trials at low risk of bias (OR 0.90, CI 0.80 to 1.03) compared with all trials (OR 0.88, CI 0.82 to 0.95). A funnel plot of all included studies did not suggest publication bias. (See online supplementary material D for subgroup analyses). Gender: At 1 year, for the limited number of trials that presented data by gender, there was a statistically significant effect for females (five trials, seven arms, OR 0.68, CI 0.50 to 0.93; I²=0%) and no significant effect for males (four trials, six arms, OR 0.76, CI 0.53 to 1.10; I²=51%). The largest effect was found in one trial,25 which tested a multimodal curriculum in males (OR 0.32, CI 0.16 to 0.65). At longest follow-up, the results were similar; statistically significant differences were found for females (seven trials, nine arms, OR 0.80, CI 0.66 to 0.97) whereas results were not statistically significant for males (six trials, eight arms, OR 0.93, CI 0.76 to 1.15). Adult-led versus peer-led: for adult-led curricula with follow-up ≤1 year (21 trials, 30 arms), there were no significant effects except for combined social competence/social influences curricula, which were more effective than controls (OR 0.58, CI 0.40 to 0.85; I²=0%). For the peer-led curricula (six trials, eight arms) compared with controls there was no overall effect, though it should be noted that social influences interventions were only tested with a single trial14 that offered a combined social competence/social influences curriculum. Tobacco only versus multifocal curricula: multifocal curricula showed no overall effect compared with control either at 1 year or at longest follow-up. Multifocal social competence curriculum (five trials, seven arms, OR 0.65, CI 0.43 to 0.96; I²=0%) and multifocal combined social competence/influences (five trials, six arms, OR 0.53, CI 0.34 to 0.83; I2=0%) both showed a significant effect at longest follow-up. Curricula focused on only tobacco compared with control (16 trials, 27 arms) showed no effect for follow-up ≤1 year (OR 0.93, CI 0.83 to 1.04; I2=31%), but there was an effect at longest follow-up (28 trials, 43 arms, OR 0.89, CI 0.81 to 0.97; I²=24%). None of the other three curricula (social influences, combined social competence/social influences and multimodal) found significant differences at follow-up of either ≤1 year or longest follow-up. Adding booster sessions after the main curriculum: six trials had 3,28 ,29 ,46 4,51 815 and 1016 booster sessions ranging from 1 to 2 years after the initial curricula. Curricula without booster sessions showed no significant effect at follow-up ≤1 year (24 trials, 37 arms) compared with controls (OR 0.92, CI 0.83 to 1.02; I2=21%), but did show significant effect at longest follow-up (45 trials, 67 arms, OR 0.90, CI 0.83 to 0.96; I²=10%). Similarly, for all curricula with booster sessions there were no significant differences from controls at 1 year or less (three trials, four arms, OR 0.70, CI 0.40 to 1.07; I2=0%), but at longest follow-up (six trials, seven arms) there was a significant difference (OR 0.73, CI 0.55 to 0.97; I2=21%). The combined social competence/social influences curricula, with booster sessions, had a positive effect at 1 year or less (OR 0.50, CI 0.26 to 0.96; I²=0%) and also at longest follow-up (OR 0.56, CI 0.33 to 0.96; I²=0%), but only for two15 ,16 and three trials,15 ,16 ,51 respectively. Age: an exploratory scatter plot of all trials of age versus odds ratios showed no trend and no subanalysis was completed by age. C-RCTs with follow-up of a year or less demonstrated no overall significant effect, and the only individual curricula types that showed positive results within this group were the combined social competence/social influences curricula. The pooled results of the trials of all curricula at longest follow-up showed a positive effect in preventing starting smoking (OR 0.88, 95% CI 0.82 to 0.95). This represents an average reduction of 12% and suggests that the effect is more evident when assessed over a longer time period. There have been no studies to identify why curricula with longer periods of follow-up are more effective. The only individual curricula types at longest follow-up that showed a statistically significant result were social competence and combined social competence/social influence curricula. A significant finding of this review is that over 60% of trials use social influences curricula, but these were not effective. Social influences curricula are widely used worldwide. Forty-three per cent of included trials in this review were based in the USA; here the DARE (Drug Abuse Resistance Education) programme, which is a social influences curriculum, is used in 75% of school districts.61 Few studies reported results by gender. For curricula presented by adults there were significant overall effects at longest follow-up and also for social competence and combined social competence/social influences curricula. The focus of the curricula, tobacco prevention only or multifocal, did not appear to make a difference. Pooled estimates at either 1 year or less or at longest follow-up showed estimates of a similar size. For curricula with booster sessions there was a significant effect only for combined social competence/social influences interventions with follow-up of 1 year or less and at longest follow-up. The strengths of the review are the comprehensive searches, use of baseline never-smoker intention-to-treat cohorts, and low heterogeneity between these trials. Comprehensive searches were conducted in multiple electronic databases, grey literature and reference lists with no limitations of date or language, and experts were consulted. It is unlikely that key trials were missed. We either derived cohorts of baseline never-smokers from trial articles or asked authors to provide such cohorts with new data runs. 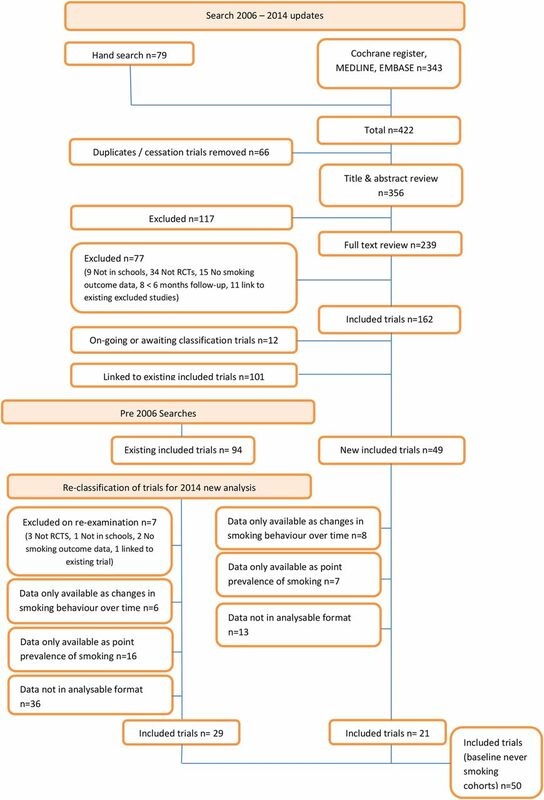 Using smoking outcomes from cohorts of baseline never-smokers provides the clearest indication of whether smoking prevention curricula are effective, and we were able to include 50 trials with 143 495 baseline never-smokers. Statistical heterogeneity between these trials was low and sensitivity analyses that assessed the effects of removing studies at unclear or higher risk of bias did not change the conclusions. The limitations of the review are that several trials did not provide data on baseline never-smokers, some trials did not provide analysable data, and the complexity of some curricula makes them difficult to classify. It is well documented that the reporting of interventions from RCTs is poor.62 This leaves the possibility that the classification of these interventions might not be completely accurate. Nevertheless, given that all information available was extracted from the published articles, we have confidence in our classification, which reported good concordance with an independent evaluator. We were not able to obtain baseline never-smoker data for 15 trials that reported data as changes in smoking behaviour over time, and 65 trials that provided only point prevalence of smoking data. The analyses for these trials are reported in the Cochrane review.60 From the original 256 eligible trials, we were unable to include 57 trials because authors did not provide analysable data on basic facts such as smoking outcomes or key elements of trial design (eg, n's in intervention and control groups) either in the article or by email correspondence. A further seven trials were excluded because there was no comparison to a control group or there were concerns over the data that were not resolved by email correspondence. Six trials used unique interventions that could neither be included in the prespecified five basic curricula types, nor grouped together into a sixth group. The prespecified selection criteria were trials that compared a curriculum to a control group and we did not compare head-to-head the limited number of trials that compared curricula. It is possible in some trials that ‘never-smokers’ could include some quitters, although most authors checked for inconsistencies in statements on baseline and follow-up questionnaires. Further bias could have been introduced by certain assumptions made by the review authors in data extraction, and subsequent statistical analysis. However, the consistency of results and low heterogeneity in the comparison suggest a consistent effect. This review found that for baseline child and adolescent never-smokers there was no effect of school-based smoking prevention curricula with a follow-up of 1 year or less, but a 12% reduction in the onset of smoking when assessed over a longer period of follow-up. When individual curricula are considered, only social competence and combined social competence/social influences studies are effective. One interpretation why social competence interventions are effective may be that students see these as helpful to their personal development and social skills, as they provide general personal and social competence, deal with problem solving, decision-making, impart assertiveness and cognitive skills to resist interpersonal or media influences, teach coping strategies for stress, and provide guidance on how to increase self-control and self-esteem. There is no explanation as to why information-only, social influences (60% of all interventions used) and multimodal curricula are not effective because no focus groups, surveys or design workshops have asked for student evaluations of their experiences with these curricula. It is possible that students perceive information curricula as lectures by adults about substance misuse. Our review indicates that curricula delivered by adults are more effective. Adding boosters to trials with follow-up of one year or less showed no significant effect, but did at longest follow-up. Trial designers and policymakers should consider tailoring future studies to explore the various aspects of the social competence curricula with adult presenters and no booster sessions. This review has highlighted that there are still gaps in our knowledge with regard to smoking prevention curricula. Further research is required to test curricula that would be effective for both genders. We noted that over 50% of trials were from North America and that there were limited trials exploring curricula for different ethnic groups. This would suggest that our results may reflect and be more applicable to developed countries rather than developing countries. A limited number of trials used the Internet to deliver curricula; future trials should incorporate the cultural world of adolescents (internet, media, music and teen idols). Future research needs to tailor study design to address these areas. Methodologically, the next steps in research are to standardise the trial design, definitions of smoking status and the content of interventions, so that more studies examine pure baseline never-smokers. Standardisation of key study design features could enable more reliable research into curricula intensity and duration (optimum number, length and frequency of sessions). Researchers should seek to utilise checklists that improve the quality of reporting62 and increase the potential impact of study findings. There is minimal information on the costs of developing and implementing these programmes and this is important as many programmes have not proven to be effective. Policymakers need to implement only curricula with proven effectiveness, and fund research projects that meet the above standardisation criteria. The authors are grateful to Jamie Hartmann-Boyce for comments on the final draft.
. A model of smoking among inner-city adolescents: the role of personal competence and perceived social benefits of smoking. Prev Med 2000;31:107–14. Centers for Disease Control and Prevention. Youth Risk Behavior Surveillance—United States, 2007. Morbidity and Mortality Weekly Report. June 6, 2008;57(SS-04). NHS Information Centre (2012). Smoking, drinking and drug use among young people in England. http://www.ash.org.uk/files/documents/ASH_108.pdf (accessed 11 Apr 2014). Review Manager (RevMan) [Computer program]. Version 5.2. Copenhagen: The Nordic Cochrane Centre, The Cochrane Collaboration, 2012.
. Influence of education and advertising on the uptake of smoking by children. Med J Aust 1990;152:117–24.
. Smoking initiation and escalation in early adolescent girls: one-year follow-up of a school-based prevention intervention for minority youth. J Am Med Womens Assoc 1999;54:139–43, 152.
. Patterns of change in adolescent smoking behavior and results of a one year follow-up of a smoking prevention program. J Sch Health 1982;52:348–53.
. Prevention of smoking in elementary schools. Can J Public Health 1981;72:259–63.
. Evaluation of an anti-smoking educational programme among adolescents in Italy. Hygiene 1989;8:24–8.
. Intervention study against cigarette smoking in Duesseldorf high school pupils [Interventionsstudie gegen das Zigarettenrauchen von Düsseldorfer Hauptschülern 1992–94]. Z Kardiol 1995;84:700–11.
. Coronary heart disease prevention in childhood: one-year results of a randomised intervention study. Am J Prev Med 1986;2:239–49. D.A.R.E. Teaching students good decision-making skills to help them lead safe and healthy lives. http://www.dare.org/about-d-a-r-e/ (accessed 30 May 2014).
. Las investigaciones sobre promocion y educacion para la salud en las etapas de infantil y primaria de la escuela espanola. Una revision de los estudios publicados entre 1995 y 2005 [Research on health education and promotion in Spanish nursery and primary schools. A systematic review of studies published between 1995 and 2005]. Gac Sanit 2008;22:658–764. Contributors RET conceived the review. RET and JM completed screening and extraction of data. RP devised the analysis plan, and RET and JM provided statistical support and meta-analyses. RET and JM wrote the text. RET, JM and RP approved the final version of the review. Data sharing statement Data used to develop the tables and figures presented in this article are fully available in the original Cochrane review: RET, JM, RP. School-based programmes for preventing smoking. Cochrane Database of Systematic Reviews 2013, Issue 4. Art. No. : CD001293. DOI: 10.1002/14651858.CD001293.pub3.